Now open for roughly a month, Chelsea Riverside Brasserie within the Wyndham Grand London Chelsea Harbour Hotel - London’s only five star all-suite property – offers impeccable service, lovely views of luxury boats bobbing about in the marina below and gorgeously presented dishes. As beautiful as the food may be, it's rather hit or miss with respect to flavour. An unexpectedly dainty starter of grilled octopus (puy lentil ragout, chorizo and rocket cress, £8.50) proves the folks in the kitchen must know what they're doing – the texture and slight char of the octopus wowed us – while a bland bowl of onion soup (caramelised onions, port, gruyere croutons, £6) suggests a cook's nonchalance toward more ordinary nosh. 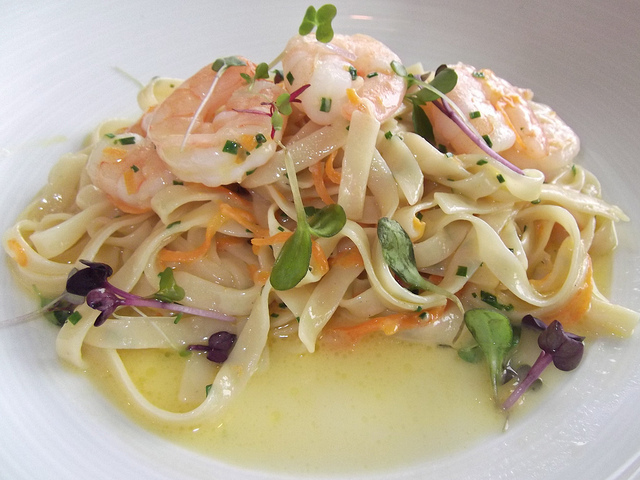 Prawn tagliatelli (prawns, ribbons of vegetables with a dill butter sauce) doesn't offend but barely deserves mention. And, Cornish crab ravioli (saffron, tomato and butter sauce, £15.50) sadly sounds better than it tastes – it was just missing something. Puds (£7 each) are a bit more inspired. Mascarpone and amaretti mousse with coffee ice cream and espresso granite is as yummy as it is pretty, and rosemary roasted pineapple (rosemary panna cotta, vanilla vodka and crème fraîche sherbet) definitely impresses as it challenges the taste buds with its fruit and herb melange. The wine list is fine. We found a bottle of Viognier Finca La Linda 2009 to add a bit of appreciated intrigue. If prices seem right and you're in the area or staying at the hotel (the burgers and the fish and chips seemed popular choices for hotel guests dining while we were there), it's worth keeping in mind. Based upon our experience, we can't recommend the brasserie for destination dining. However, we should probably mention that we visited for an early evening meal; with the river and the boats, Sunday brunch might be a much nicer time for enjoying the setting. Chelsea Riverside Brasserie is located at Wyndham Grand Chelsea Harbour, Chelsea Harbour, SW10 0XG. Find out more at www.wyndhamgrandlondon.co.uk. Disclaimer: Londonist visited Chelsea Riverside Brasserie upon invitation by the restaurant.